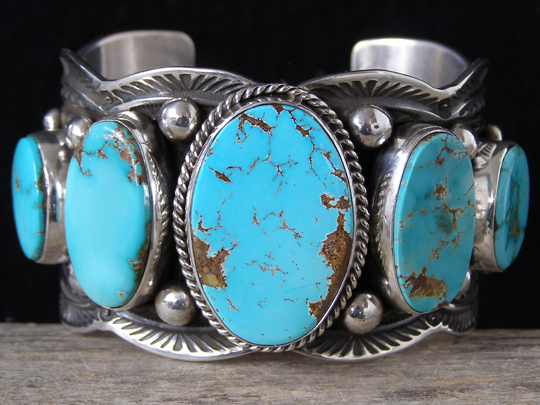 This scalloped-edge row bracelet by Guy Hoskie features five well-matched ovals of natural, untreated Royston turquoise from Nevada. The center oval is wrapped with twist wire and large, fat raindrops are interspersed between the stone settings. Guy's exacting traditional stampwork decorates the cuff to the terminals. This is glassy smooth, fine-grained natural turquoise that takes and holds a lustrous polish. Stones: center 1 3/16" x 13/16"; left & right 15/16" x 1/2"; far left & far right 11/16" x 1/2"